The electrifying new thriller from international bestseller Karin Slaughter explores the deadly secrets kept between a mother and daughter. Andrea Cooper knows everything about her mother Laura. She’s knows she’s spent her whole life in the small beachside town of Gullaway Island; she knows she’s never had any more ambition than to live a quiet life as a pillar of the community; she knows she’s never kept a secret in her life. Because we all know our mothers, don’t we? But all that changes when a trip to the mall explodes into violence and Andrea suddenly sees a completely different side to Laura. A side which is a million miles from the quiet, gentle woman who brought her up. And more than that, news coverage of the mall attack puts Laura’s face on every TV screen in the country – and leaves her terrified. Because it turns out that before Laura was Laura she was someone completely different. For nearly 30 years she’s been hiding from her previous identity, lying low in the hope that no one will ever find her and re-open the wounds left by the terrible events which made it impossible for her ever to go back. But now she’s been exposed, and nothing will ever be the same again. 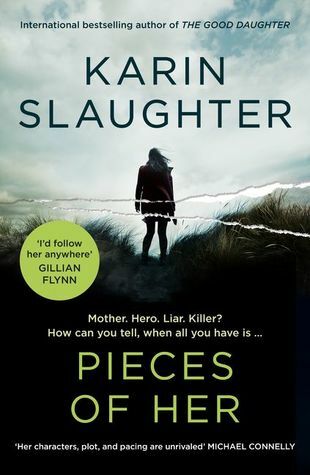 I don’t know why I am always surprised when I read a Karin Slaughter standalone – by now I should know that it will be a fantastic read, with mystery, intrigue, a great in depth look at the human condition, prose to make you think and a murder or two. This is another such brilliant book – totally different to anything else I have read by this author (which is a good surprise), you could call this a coming of age meets a seasoned manipulator who has never experienced the bonds and sacrifice that is a mother’s love. Another great read from this fabulous author. This entry was posted in Book supplied by publisher or author for review, Crime Fiction, Mystery and Thrillers, Post Script: Book Reviews and tagged Karin Slaughter, mothers love. Bookmark the permalink. Unfortunately Slaughter is just too dark & gritty for me but thrilled you enjoyed! You might find this one not quite as dark – though there is darkness Anne.